StormFitters leads from the front when it comes to procuring excellent quality storm abatement products and offering expert window installation services at reasonable prices. We offer value for money storm abatement products and services to achieve ultimate in customer delight. Serving Florida for more than three decades, StormFitters excels in procuring and installing high quality storm abatement products. It has so far completed over 15,000 projects to utmost customer satisfaction. These figures are enough to tell why StormFitters remains the preferred choice of Floridians who want to keep their properties, prized possessions and family members safe from the fury of nature. By offering storm abatement solutions with a difference, the company has provided protection to domestic and commercial property owners during inclement weather conditions in Florida. StormFitters works with code authorities, suppliers and others to offer a find blend of products and services to ensure customers get value of money every time. The company does severe weather product installation in such a way that it not only adds more to the overall beauty and structural strength but also increases the value of property manifold. The entire range of products thwarts debris from flowing in during storm other than blocking the air leakage from the commercial and residential properties. This helps property owners cut the energy bills and save big. StormFitters also has considerable expertise in replacing windows in already built structures. For custom home windows on existing panels or new windows, the company is adroit at exploiting the best window manufacturing process for both impact and non-impact designs. Owing to these reasons, those who want new window installation services in Tampa, FL or install new windows in Clearwater, FL can count on StormFitters. 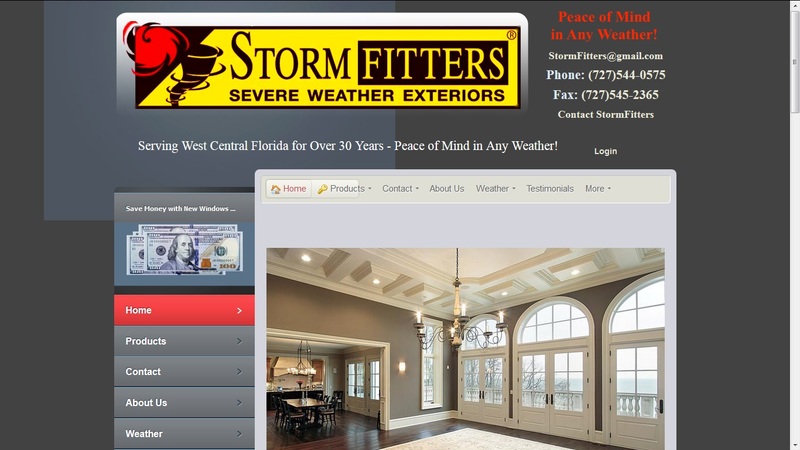 St. Petersburg, Florida based StormFitters remains the preferred choice of domestic and commercial property owners in 10-county, Tampa Bay market area, St. Petersburg and Clearwater who want buy quality storm abatement products and hire expert installation services at reasonable prices. The company is in the business for more than 30 years and has successfully completed well over 15,000 projects so far. This speaks enough about the expertise StormFitters has in the field and popularity it enjoys among domestic and commercial property owners. Those who want to get house window installation in Tampa, FL should look no further than StormFitters. StormFitters 2501 Anvil St. N.